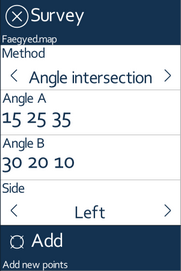 This panel provides methods and controls to solve Coordinate Geometry problems. Method: one of the six methods can be selected here. Distance / Angle A: depending on the method the primary arguments of the method can be entered here. Several angles and distances can be entered with space separator. Angles are in decimal degrees. Distance / Angle B: this input receives the secondary arguments for the selected method. Several angles and distances can be entered with space separator. Side: every method has two solutions depending on the clockwise/counter clockwise order of the angles. This option can switch between the solutions. If there is a feasible solution, then the program calculates and displays the points on the map. Pressing the Add button at the bottom of the panel creates the point records in the CoGo layer. 1. Angle-angle intersection: P point is defined by two angles, one between segments A-B and A-P, and another between B-A and B-P.
2. Distance-distance intersection: P point is defined by two distances, one from A to P, and another one from B to P.
3. Polar survey: P point is defined by the distance between A and P, and the angle between segment A-B and A-P.
4. Rectangular survey: P point is defined by two distances, one from A to the perpendicular point, and another between the P and the A-B segment. 5. Distance-azimuth: P point is defined by the distance from A, and the angle between geographic north and P point where the origin is A. 6. Inverse distance-azimuth: P point is defined by the distance from A, and the angle between geographic north and P point where the origin is P.